Arthur Edwaine Crabbe was born in Thorpe-St. Andrew, England on March 25, 1890. He moved to Saskatchewan, Canada in 1908 where he gained a real passion for landscapes. The very next year he leaves Canada to live with his brother in Oakland, CA and study at the San Francisco Institute of Art. He took on the name Arthur Beaumont in 1915 and two years later leaves his construction job to open an art studio and paint full time. He studied at the Chouinard School of Art from 1921 and until 1925 when he receives a grant from Mr. Chouinard himself to study in Europe. Upon his return in 1927 he was given a professorship at the same institution. His first major exhibition was in 1931, the same year he was first commissioned to make a few military portraits. 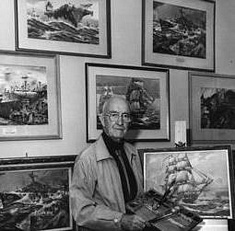 This was the start of a great career of painting Naval themes, for which he is known throughout the world thanks to several stories in National Geographic Magazine which were illustrated by him. He was celebrated for his art as well as for his civic merit, and in 1976 a retrospective of his work was held at the Laguna Beach Museum of Art. This admirable painter died on January 23, 1978.